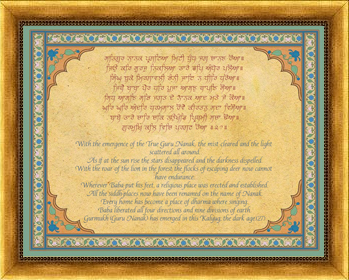 This past week we released a new feature on SikhNet (Shabad Printer) which allows you to beautifully customize, share or print any daily hukamnama or Gurbani Shabads. You can choose from many different background frames, font styles, language types (Gurmukhi, Larivaar, English Translation, Spanish Translation, Romanized, etc). You can select to view in line by line format or block format. Change the sizes and alignment and all kinds of other things. This is an easy way that anyone can customize the Daily Hukam or Gurbani to display in a really beautiful way, and share it. No need to install fonts or any software. Just browse, customize and share! By default the SikhNet Shabad Printer displays the current Daily Hukamnama from Harmander Sahib (The Golden Temple), in Amritsar India, however you can customize it to display any Shabad using the SikhiToTheMax shabad ID (see below video for details on how to do this). So aside from creating a beautiful presentation of Gurbani what would you do with it? Well, I’m sure there are lots of creative things you can come up with but here are a few ideas. 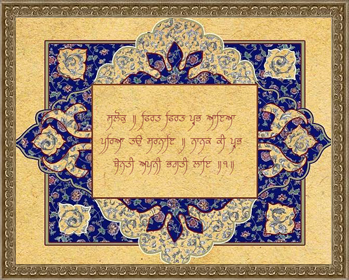 Print and Frame the Hukamnama – Many of us have memorable occasions (weddings, birthdays, anniversaries, etc) and maybe on that day you read a very special message from the Guru and wish to keep and remember it. You can print the customized hukam out and put it in a frame for your desk or home. This way whenever you see it you will remember the Guru’s words. Shabad Printout for Gurdwara – Some events or Gurdwaras do not have a way to display Gurbani using a projector. This is one way you can customize and print a particular shabad that people can use to sing and understand the Gurbani. Social Sharing – You may have read a Hukam that is really inspiring and want to share it with your family and friends. After you customize the layout you can click on the "Share this Shabad" button and this will allow you to share the customized hukam that you have created through Email, Facebook, Twitter & other ways. Next steps which we are working on is making the Daily Hukamnama page on SikhNet customizable so that you can choose the format and layout that you want to view the hukam every day. That way you can view the Guru’s message the way that you like. We might even give new options for different email formats since many of you receive the hukam by email. I made a short video giving you a quick walk through of the features of the SikhNet Shabad Printer. I suggest that you click on the button to view the video full screen otherwise it might be hard to see the details. Please let me know what you think and be sure to share with your friends and family! Please click the "Share this" link below or Facebook "Like" button to share this with your friends & Family! What a great gift to have the ability to make your favorite shabd or hukam into a work of inspiration for your home!!! I wanted to print shabad from Sri Guru Granth Sahib Ang. 617 .. I wet masthesikhi web site and type the page number but it did not bring the whole shabad .. I wanted print only the end part. ( Soraṯẖ mėhlā 5. Can you please tell me how can I print this shabad.. The shabad printer does not currently work for only select lines. You can only do the whole shabad. If there is enough interest in it and people use the shabad printer we could add that feature, but for now you'll have to make due with what is there. Gurumustuk Singh Ji Looks very Cool. I am saving the Shabads as PDF files on my ipad. Singh Ji…how do I save the Shabads as pdf or jpeg files? Its soooo great. One suggestion: is there any way to change font size for shabad and translation separately? Some font combinations may look better if the english was a bit smaller than the Gurmukhi. Thanks for this…its great!!! GMSingh Ji. Thankyou Thankyou THankyou.. So very much for all the efforts you and your "Team" have put it to this and Sikhnet. ! I used to check Sikhnet everyday and nearly 20 years on.. still do ! This is a testament to the value your site provides for everyday "sikhs" like me and now millions around the globe. ! Well done and keep up the excellent work! Sorry if this is a double comment but I wasn't logged in before so I might be seen as "hiding" my identity. The comment that I made earlier was relating to SGPC and just wanted to say that an organisation (SGPC) of such financial backing has website that looks was designed in the 1900s and they must follow the lead set by SikhNet to promote Sikhism. If they can't do that they should at least support SikhNet! Gurbani Everywhere – view Gurbani on any mobile device! Awesome, thank you so much for being on the pioneering edge and representing our Gurus well! Kirtan in Harimandir Sahib - Playing Gurbani in Harmandir Sahib This is a VERY historical moment. This is the first time any white Western Sikhs played inside the Golden Temple.